It's 03:22 in Tavagnacco, Italy right now. Traffic A23 - KM 25,2 - Udine Nord itinere nord A view of the current traffic situation. Tricesimo: Traffic A23 - KM 31,0 - Udine Nord itinere sud, 2.4 miles away. 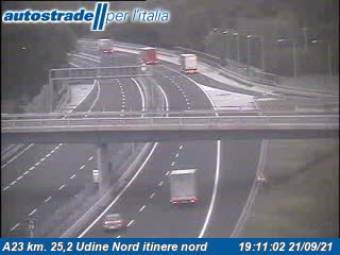 Udine: Traffic A23 - KM 22,0 - itinere sud, 4.5 miles away. Mels: Traffic A23 - KM 37,0 - Ledra Ovest itinere sud, 6 miles away. Buja: Traffic A23 - KM 42,0 - Gemona itinere nord, 6.8 miles away. Osoppo: Traffic A23 - KM 47,0 - Gemona itinere sud, 11 miles away. Gemona del Friuli: City Panorama, 11.1 miles away. Alesso: Traffic A23 - KM 54,3 - Carnia itinere nord, 15 miles away. Somplago: Traffic A23 - KM 56,1 - Viadotto Somplago itinere nord, 16.8 miles away.